The lean-to pergola: also known as a patio pergola, attached pergola, carport or entranceway pergola, has become a very popular addition to the house and garden in recent years. And rightly so! It creates a wonderful outdoor room where we can relax and entertain. Happy days! 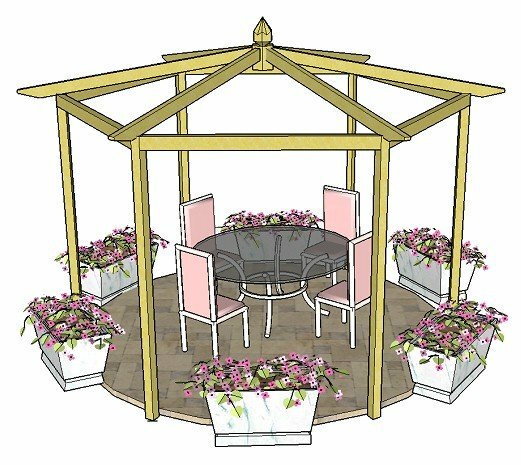 We'll be looking at how to build, in any size, a fantastic attached pergola (with which to grace any patio or deck) from the additional pergola plan series. Also we'll see what's on offer in the manufactured ready-made market. 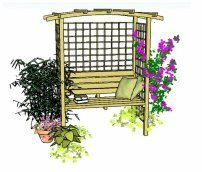 There are some fabulous attached pergola kits for those who'd like all the cutting and drilling done by machine, and lots of brilliant accessories to make the pergola really special. Just the job. The third way, which is becoming very popular, is to have a carpenter build one for you, using the plans. 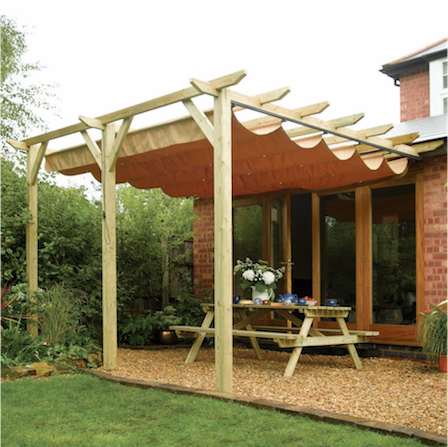 This style of pergola can be put to many uses as an entry pergola or pergola porch, a car port, patio pergola, log store, an outside porch, a utility area or garden seating area. 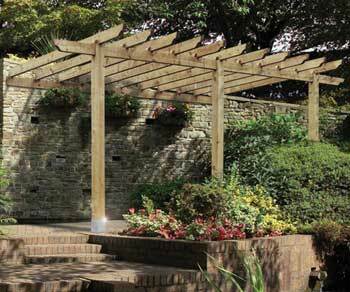 It's a very versatile outdoor space, and is by far the most popular pergola built from the plans. Buy a pergola kit if you'd like everything cut to size or you'd like one of the many unusual designs available - and some of them are truly stunning - or you may prefer a maintenance-free vinyl pergola design. 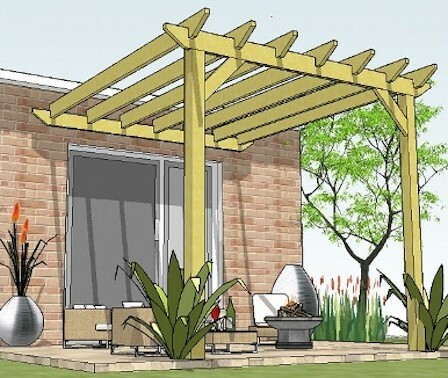 Choose a pergola plan, if you need your pergola to fit a particular space (as the plans can be made to any size), if you like the idea of building your own wonderful garden structure, or if you'd like to save a bit to spend on planting and furniture. If you feel you're not quite up to it, get someone to build it for you. Make a party out of it with friends and family (these really are the best of times). It really is a great feeling to build a pergola of your own. For something that looks so good, it doesn't actually take that long, and gives such a sense of achievement. 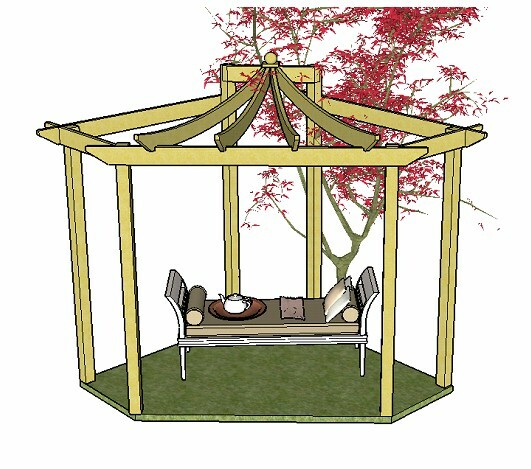 If you'd like to have a go at building your own attached lean-to pergola, you can find these, step-by-step plans here. 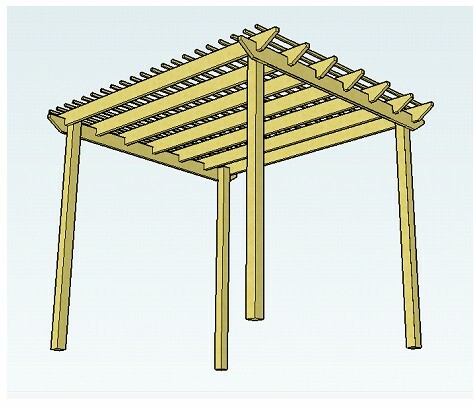 The attached pergola plans can be fully adapted to fit any situation and come with 18 free rafter tail templates to make your lean-to pergola a truly unique structure. 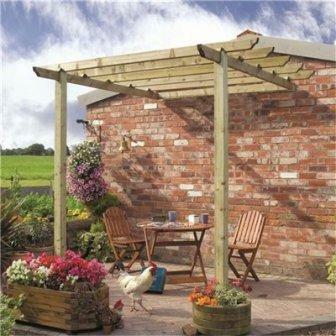 There are some wonderful attached lean-to pergola kits with which to transform a porch, house or garden wall, available in different styles to suit a range of purposes. 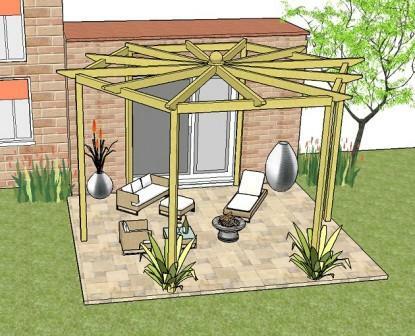 For a traditional style patio pergola, we can create this attractive seating area. Notice how this next pergola has rafters that run from front to back, rather than side to side like the one above. It just depends on which style you prefer. 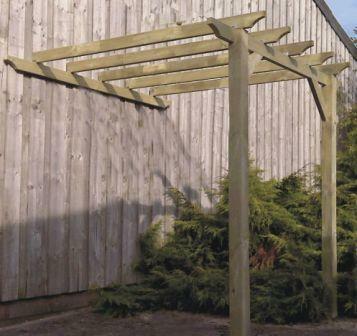 Being made of treated and planed timber, these are good quality pergolas, available in a huge range of sizes, from around 6ft to 21ft - and any permutation of size within! They are certainly worth a look. Another option is this attached pergola. 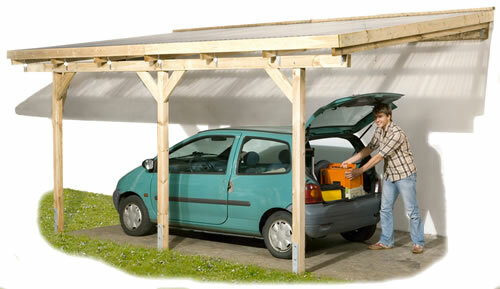 Classed as a carport, it can be used for many different purposes and situations. Its long length makes it ideal for running along the side of a house or garden wall. It's ideal as an entranceway or carport, too. This is the same for many pergola kits now. It makes them much more versatile. Here's an attached pergola being used as a carport - very useful for this purpose, especially if you're without a garage. Other beautiful wooden pergola kits are the Contemporary patio pergola and the Dragon patio pergola, which are ideal as an entranceway or porch, but are as big as most traditional-style rectangular or square pergola kits. Measuring 2.7m (8'10"), they are big enough to house a dining table and chairs, or a couple of loungers and coffee table, with planters and a fire pit, for instance. Both styles would be fantastic as an seating area close to the house. And very attractive they look too, the Dragon design being an Asian-inspired pergola, with turreted pagoda style rafters. Another pergola style that has been very popular this year is the pergola canopy, which are also called an attached pergola awning. It can make an outdoor area usable in a wider variety of weather conditions than a traditional pergola, whether that's protection from the sun, whilst eating or relaxing, or in less clement weather, for barbecues. We've all been there! Versatility is the name of the game, especially as we're using our gardens even more for getting together with friends. 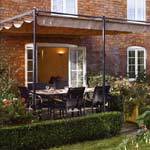 Pergola awnings, being fully retractable, ensure that we can have more of the good times! There are some real stunners around at the moment, with lots of great outdoor cushions and accessories to make them look really special (see below). 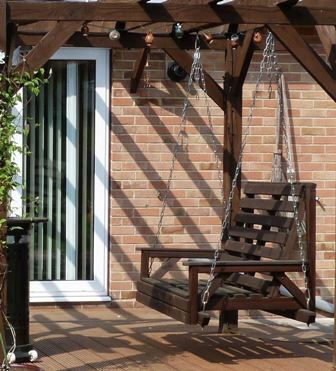 Hang swing seat kits off pergola rafters, or have them free-standing. 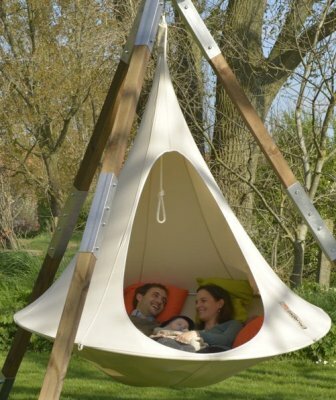 A wooden swing bench gives the area a relaxing feel, and the cocoons will look stunning in a modern setting. Everyone will be flocking to sit on the seat, whether its a wooden swing bench, a free-standing hanging chair, a cocoon, or hanging seat. 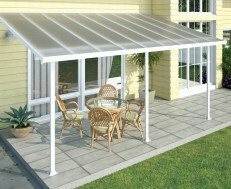 Only recently available, this attached vinyl pergola has a strong, durable polycarbonate roof. Coming in a range of lengths, it is ideal as an attractive, maintenance-free solution. Many people have asked me about this pergola style, over the last few years particularly. They've all wanted the maintenance-free aspect and the covered roof that this design offers. All options are 3 metres from the house, and come in lengths between 3 metres and 9 metres - so big enough for everyone's needs! 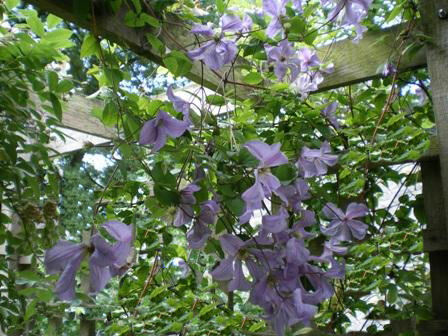 Both climbing plants and pot plants can make a huge difference to your pergola. Try arranging a few pots or planters either between the posts or next to them. Creating a colourful display can be inexpensive and easy to achieve, yet can be simply stunning, especially with the choice of plants that are available. Go cottage garden, with wispy climbers and hanging baskets, or ultra-modern by using simple, architectural planting in single colours with striking forms. Even if the pergola is intended as a utility area, it can still, and should, be made to look like an attractive feature in your outdoor space. Take a look at other pergola pictures and pergola ideas for inspiration. Make your garden a beautiful, useful and interesting place to relax.